Jean Hoffecker Obituary - Lititz, Pennsylvania - R.T. Foard & Jones, Inc.
Jean M. Hoffecker, 96, went to meet her Savior Jesus Christ on Monday, April 1, 2019 from United Zion Retirement Community. She has been reunited with her husband, Lee C. Hoffecker, Jr. with whom she shared 62 years of marriage. Also meeting her there are her parents Clarence Ogden and Margaret Crossan. She is survived by a daughter, Margaret Trimble, Lititz, PA., and three sons, John (JC) Hoffecker (Anna) Johnstown, CO, Roger (Martha) New Straitsville, OH, and Benjamin (Gail) Smyrna, DE. ; nine grandchildren and 13 great grandchildren. She was also preceded in death by her son, Lee C Hoffecker, III and her brother, Clarence (Sonny) Crossan. 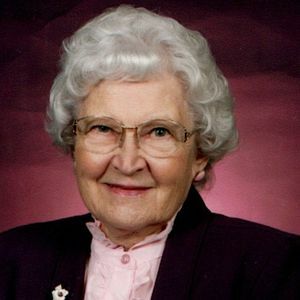 A true Proverbs 31 woman, Jean provided and cared for her family as a farm wife and mother. Never idle, she crocheted, sewed, and crafted her entire life. She kept the books for the family farm and Agway businesses working long into the evening and rising early in the morning to tend a large garden. She canned and froze vegetables so that here was never a lack of nutritious food. She taught Sunday school for many years and served on the board of Women Aglow. She volunteered at Broadmeadow School when her two youngest attended. A virtuous woman, she guided her family in moral principles, teaching forgiveness and loving kindness. She was deeply impacted by a spiritual rebirth in the 1970's which brought her great joy. Her family wishes to express much appreciation for the love, attention, and care shown to our mother during her years at United Zion Retirement Community and most especially during her final years and most recent days. Funeral services will be held in the chapel at Gracelawn Memorial Park, at 2:00 pm on Monday, April 8, 2019. Family and friends may begin the visitation beginning at 1:00 pm. Burial will follow the service at Gracelawn Memorial Park. Add your thoughts, prayers or a condolence to Jean's guestbook. Please enhance this tribute to Jean by adding your memories and photos.